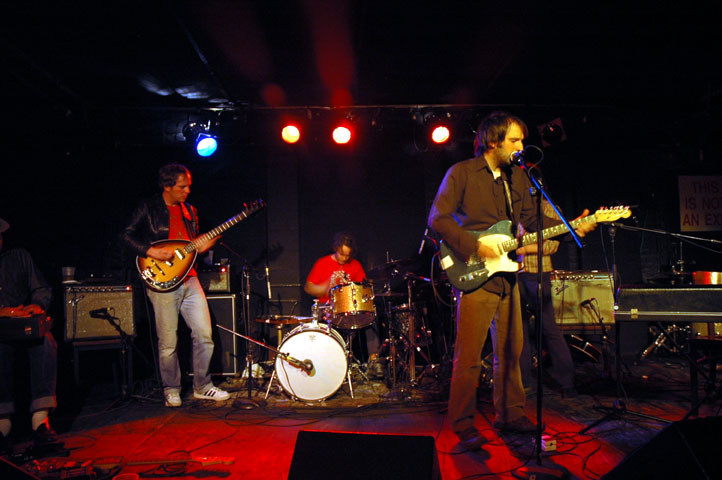 I first saw Kelley Stoltz at Arlene's Grocery during CMJ 2003 as part of Crock-O-Dials, his Echo & the Bunnymen tribute act -- also featuring Spiral Stairs on guitar -- whose appearances in San Francisco had become legendary. They played Crocodiles in its entirety and nothing else, but went go the whole nine yards: smoke machines, camo outfits, and Stoltz doing a perfect Mac the Mouth impression the whole time. "You may have heard this one on John Peel last night." What a blast. Will Sergeant, who had played with the real E&TB earlier that night at Webster Hall, was in the small crowd to see Crock-O-Dials but he didn't join them onstage. Stoltz makes his own records too, which I'm sure he'd rather be known for. Very good ones too. Below the Branches is his third album -- and first for Sub Pop -- and I've become quite enamored with it over the last month. It doesn't really sound like the Bunnymen; piano is probably the predominant instrument and the production, which seems purposely lo-fi, is varied. If anything, the record sounds like something a mid-'70s singer-songwriter like Randy Newman, Paul McCartney, or even maybe Skip Spence. Seeing him perform his own songs live at Mercury Lounge on Saturday night, with the constraints of a live band (albeit a good one), some of the Bunnymen-isms crept back in. He obviously spent so much time imitating Ian McCulloch that some of the phrasing stuck; the way he sings the word "reeling," for instance. And just the timbre of his voice puts him in the same vocal range as McCulloch (or Jim Morrison). And some of the guitar playing owes much to Will Sergeant's stylings. These are not bad things. It's who he is. And Stoltz put on a fantastic show which pretty much won the whole crowd over. In addition to being a great musician, he is also quite the charmer, raconteur, and comedian. Flitting between guitar and a Fender Rhodes, Stoltz played for about 45 minutes, mostly songs from Below the Branches. With half the stage taken up by the massive amount of equipment The Mystery Jets had brought, he and his band (a really great drummer and bassist, plus a second guitarist who, at one point, played his instrument with a screwdriver). At one point he conducted the crowd to hum along to the loud electrical hum coming from the PA; at another he did a spot-on impersonation of color-obsessed jazz poet Ken Nordine; another song morphed into Pharoh Sanders' "The Creator Has a Master Plan" for a good ten minutes before "bringing it home." Actually all three of those things may have happened during the same song. I really should bring a notebook to shows. MP3: Kelley Stoltz - "Birdies Singing"